This Turbo Yeast is tailor made for The Amazing still – and the only yeast in the world that will be recomended for the still – but it will improve all home distillation. 1. Dissolve 6-8 kg (13 -17 lbs) sugar into 8 liter (2 US gallons) hot water. Make sure the sugar has completely dissolved before continuing. 2. Top up to 25 liter (6.5 US Gallon) with cold water. 3. 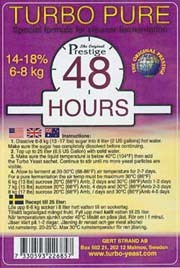 Make sure the liquid temperature is below 40°C (104°F) then add the Turbo Yeast sachet. Continue to stir until no more yeast particles are visible. 4. Allow to ferment at 20-30°C (68-86°F) air temperature for 2-7 days. For a pure fermentation the air temp must be maximum 30°C (86°F) 6 kg (13 lbs) sucrose 20°C (68°F) Amb, 2 days and 30°C (86°F)Amb 1-2 days 7 kg (15 lbs) sucrose 20°C (68°F) Amb, 4 days and 30°C (86°F)Amb 2-3 days 8 kg (17 lbs) sucrose 20°C (68°F) Amb, / days and 30°C (86°F)Amb 4-5 days.